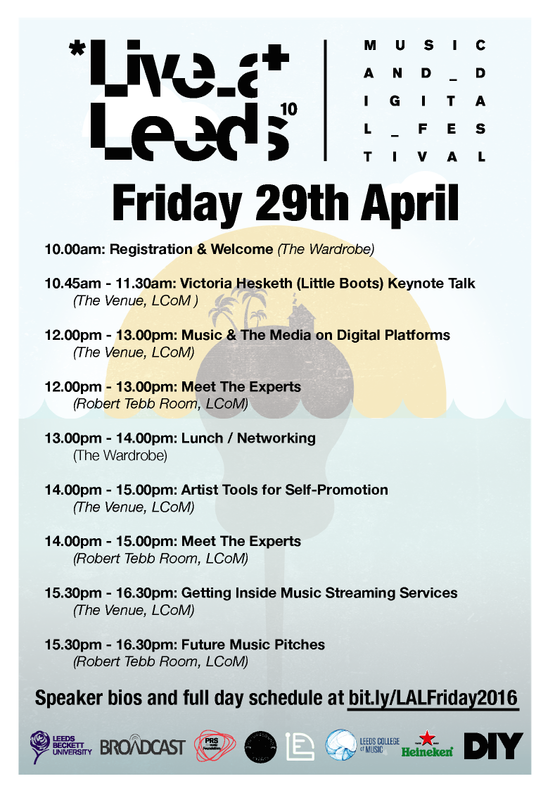 Live At Leeds Music & Digital Festival Friday Panel event kicks off with a keynote talk from Victoria Hesketh aka Little Boots. An electronic pop artist, DJ and record label founder, Little Boots first emerged in 2008 and with the release of her Gold-Selling debut album ‘Hands’ the following year, she topped the BBC Sound Of Poll and received Brit Awards Critics Choice Nomination. Freeing herself of the major label machine she went on to found her own label On Repeat Records and independently released various EPs and two more critically acclaimed albums - 2013’s ‘Nocturnes’ and last year’s ‘Working Girl’, as well as signing and developing further promising up and coming British pop artists. She continues to tour internationally, both as a live performer and DJ. Her passion for combining music and technology has led to collaborations in wearable tech and innovative electronic instruments such as the Japanese designed Tenori-on, and her own interactive iPhone app. She is also a published writer and regularly speaks at events on women and entrepreneurship in the independent music sector. A panel bringing together publishers, journalists, bloggers and musicians, to discuss the way music journalism is adapting to online media, working across a variety of platforms and with different partners, to promote the best new music. Rupert Veneker has enjoyed a lifelong career in advertising, where he started in major multinational agencies working on brands including Heinz, Procter & Gamble and many others. He founded Sonic Media Group in 2004, a marketing, advertising and publishing group that specializes in music and lifestyle related marketing, they are the publisher of DIY Magazine, the UK’s leading dedicated music lifestyle media title for a new generation, who are still excited about music. Their clients include record labels, festivals (including Live at Leeds), music export agencies, and brands looking to integrate music into their marketing strategy, such as Dr. Martens and Jagermeister. Working as a freelance music journalist, editor, copywriter and occasional hapless admin person; native Bristolian Tiffany Daniels contributes to UCAS, Metro, Time Out, WOW 247, EllenwoodEP as well editing new music blog Drunken Werewolf. Consuming new music faster than water and speaking cat language are among her additional skills, as well as having an unhealthy obsession with castles. @shadowboxxing. Harry Ridgeway is a Leeds based musician, promoter & music PR. Moving to Leeds in 2012, he worked as part of the team delivering Communion Presents in Leeds. He has since established himself as a solo artist, most recently as Altar Hanglands, as well as a promoter, co-founding High & Lonesome & it’s namesake festival in 2014. Harry also works for I Like Press, working on festivals including Live at Leeds, Slam Dunk & Best Kept Secret, as well as a diverse array of bands, venues, bars, breweries and other specialist clients. Discussion on the variety of ways artists can use online tools and platforms to promote themselves online, including ways to independently release music, digital marketing, social media and more. Joe Vesayaporn has worked at Music Glue since its early days in 2008, building it up to its current position as the market leader in Direct to Fan ecommerce. Its users include more than 25,000 artists, labels, venues, promoters, festivals and merchandisers worldwide. Music Glue empowers artists to take control, own their data and sell anything, to anyone, anywhere, in any currency, any language and via any device. Victoria Hesketh aka Little Boots is an electronic pop artist, DJ and record label founder, who first emerged in 2008 and with the release of her Gold-Selling debut album ‘Hands’ the following year, she topped the BBC Sound Of Poll and received Brit Awards Critics Choice Nomination. She went on to found her own label On Repeat Records and independently released various EPs and two more critically acclaimed albums - 2013’s ‘Nocturnes’ and last year’s ‘Working Girl’, as well as signing and developing further promising up and coming British pop artists. She continues to tour internationally, both as a live performer and DJ. Nick Simcock is a festival director, venue manager and mini-label co-founder from the North of England currently lecturing music business at Leeds College of Music. Digital aggregators and artist representatives pull apart some of the mechanics around streaming services, the best way to approach using them effectively, and the differences between subscription and ad-supported models for artist and fans alike. Matt Parsons co-founded Ditto Music in 2005 to help independent artists and labels achieve success on their own terms. Ditto provide promotion and distribution services for 85,000 artists, 17,000 labels and have 6 worldwide offices. Ditto launched ‘Record Label In A Box’ recently, which has received worldwide praise and scored various awards. Chris Duncan is Senior Manager, International Artist Services at The Orchard. Operating out of the London arm of the New York-headquartered digital distribution company, he oversees key relationships with an array of artists and labels, including the likes of RJD2, ATP Recordings, JAWS, Fierce Panda, and Transgressive Records. Chris is also the European label manager for Frenchkiss Records (Eleanor Friedberger, Diet Cig, Local Natives, Bloc Party etc.) and somehow finds time to manage an artist called Ben Hobbs too. Paul Pacifico is CEO of the Featured Artists Coalition (‘FAC’), the organization in the music industry that represents the interests and rights of the artists. The FAC has 5,000 members and its board includes Nick Mason (Pink Floyd), Ed O’Brien (Radiohead), Sandie Shaw, Imogen Heap, Katie Melua and many other artists at all levels of the industry. Paul is also President of the International Artist Organisation (‘IAO’), which unites artist organisations from different countries to speak with one voice. In his early career, Paul spent almost 10 years in the City in banking and strategy consultancy before leaving to focus on Specific Music in 2005. Specific Music is a creative music consultancy which designs and delivers bespoke music for industry clients as well as brands and charities. Paul also set up The AllStars Collective, which is made up of 40 of the world’s top session musicians. Paul still performs and records with his band Pacifico Blues. Sarah Statham is a musician and promoter based in Leeds. Most known for playing guitar and singing in Esper Scout, as well as the drummer for Molars/Ecate and releasing solo material under the name ‘Fig by Four’. Originally from Manchester she’s been in bands for over ten years, writing, self-recording and touring in the UK and the US as well as teaching at the Willie Mae Rock Camp for Girls in NYC, the Leeds Music Hub and other places locally. She co-runs the independent label ‘Bomb the Twist’ with Esper Scout bandmate Rebecca Jane, who together put on events and make zines. Sarah is also part of the ‘Chunk’ DIY collective, a group of bands who host gigs and practices at their venue and studio space in Meanwood. She is an all round infectiously encouraging member of the Leeds Music Scene. A chance to speak directly with the music industry professionals attending the panel event. Attendees have the opportunity to register for a session with a collection of experts with a range of expertise across the music industry. Guests include Stuart Belsham (PRS For Music), Gordon Charlton (Big Life Management), Alan Raw (BBC Introducing), Bhavesh Patel (PRS For Music Foundation), Simon Palmer (Garbutt & Elliot Accounts), Sam Robson (Tri-Tone Management) as well as other speakers from the day including Joe Vesayaporn, Rupert Veneker, Chris Duncan, Matt Parsons and more. Stuart Belsham is part of the Education and Outreach team at PRS for Music, an organisation responsible for ensuring songwriters, composers and music publishers receive royalties for the public performance of their music e.g. on radio & tv, online and live. Stuart’s role is to engage with the wider music industry community in order to raise awareness and a better understanding about PRS for Music. He provides talks and lectures at educational establishments, is involved at music industry events and develops and hosts events and advice sessions. Alan Raw is CEO The Creative & Cultural Company, BBC Introducing Presenter, Creative Director Hull International Photography Gallery & HIPphotoFest and a Hip Hop Drummer. In 14th year as a BBC Presenter/Producer. Started and hosts the BBC Introducing Stage at Leeds Festival. Patron of Hull Folk Festival. Drummer in endoflevelbaddie & Celtarabia, Chair of the World Drumming Network. Works at many music events as a Photographer including Womad for over 20 years. CEO of The Creative & Cultural Company; developing cultural partnership projects locally & internationally (currently co-developing the In&At photographic project with the European Capitals of Culture 2016 to 2018). Bhavesh Patel - Since March 2000 the PRS Foundation have supported over 5,200 new music initiatives to the tune of over £22 million. We do this through open grant schemes which are available to musicians and organisations four times per year and partnership programmes which we lead in response to specific needs and gaps in funding. Sam Robson is a former Leeds musician and now manager of VITAMIN (National Anthem / Columbia), Natalie McCool (Alpha / BMG) and a number of up-and-coming artists for Tri-Tone Management; the company that brought Justice into the UK, running the UK office of Ed Banger as well as starting the Deltasonic and Twisted Nerve labels. Scott Lewis is head of Clue Records, an independent & DIY label based in Leeds. Home to Allusondrugs, NARCS, Forever Cult, TRASH & SUNFACE. He alsolso manages bands & runs Handsome PR. A series of new business ideas, pitched in a quick 10-minute presentation by music business undergraduates to tech and music industry experts including Ben McAvoy (WMP), Stuart Clarke (Media Yorkshire), Joe Vesayaporn (Music Glue) and Rupert Veneker (Sonic Media / DIY). Exciting new ideas focused on digital business within the music industry. Come along and watch in a friendly and supportive environment. You may witness the start of an idea that has the potential to be the next Spotify or Soundcloud. Ben McAvoy is the Director of WMP (www.w-m-p.co.uk) a versatile team of composers, sound designers and producers working and collaborating from the same project studio here in Leeds. In the last couple of years they have worked with some of the largest and most successful production companies and sync supervisors in London on behalf of brands such as Unilever, Braun, Seriously Strong Cheddar and Clarks as well as writing for television such as the hard hitting, powerful documentary “Behind Closed Doors” that aired on BBC1 in March. They are driven by musical collaboration, innovation and appreciation and love to be challenged, taking pride in all the work they produce.